Every year, people from all over the world come to America to realize the American Dream. Despite starting from scratch, many go on to experience great success. Emigrants have a different perspective and recognize the opportunities, benefits and value that surround them. They have something those born-and-bred in America don’t—the Emigrant Edge. "The Emigrant Edge that I developed here continues to be the fuel to help me achieve my goals and dreams. Now it’s your turn. I want you to take advantage of the opportunities that are in front of you and unleash the principles of the Emigrant Edge to build your own American Dream." Publisher: The Emigrant Edge is published by Howard Books, a Division of Simon & Schuster. Brian Buffini emigrated from the comforts of his beloved homeland, and immigrated to San Diego. Nineteen years old and with only ninety-two dollars in his pocket, Brian embraced both the challenges and opportunities this new land presented. After discovering real estate, he quickly became one of the nation’s top Realtors and founder of the largest business training company in North America. But Brian isn’t alone in his success: immigrants compose 13 percent of the American population and are responsible for a quarter of all new businesses. In fact, Forbes magazine boasts that immigrants dominate most of the Forbes 400 list. 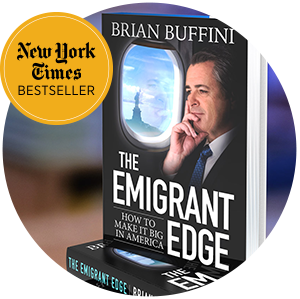 In The Emigrant Edge, Brian shares seven characteristics that he and other successful immigrants have in common that can help anyone reach the success of their dreams, no matter their vocation. Brian Buffini has unlocked the secrets of not only his own success, but also why so many newcomers make it big in America. Brian Buffini has translated his own success as an immigrant into a winning formula for anyone who wants to succeed. "The Emigrant Edge" is a #1 Bestseller!